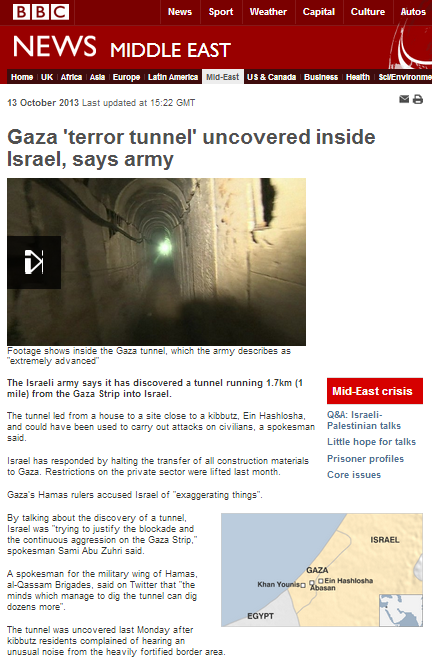 BBC not sure cross-border tunnel intended for terror? On countless occasions BBC audiences have repeatedly read or heard permutations of the following message, with the implication being that Israeli concerns regarding the misuse of construction materials entering Gaza are in fact much ado about nothing. The announcement on Sunday, October 13th 2013 regarding the IDF’s discovery of a 1.7 kilometer long, 18 meter deep, concrete-clad tunnel spanning the border between the Gaza Strip and Israel should surely put paid to any further insinuations that control of the entry of building materials into the Gaza Strip is an unwarranted product of Israeli exaggeration. Obviously, the suspicion that building materials intended for civilian reconstruction projects are being expropriated by Hamas for military use is not unfounded and impartial journalists will now of course be investigating that diversion of resources from the civilian sector. Despite its “smaller operation at the weekend“, the BBC News website produced an article on the subject within hours of the announcement. 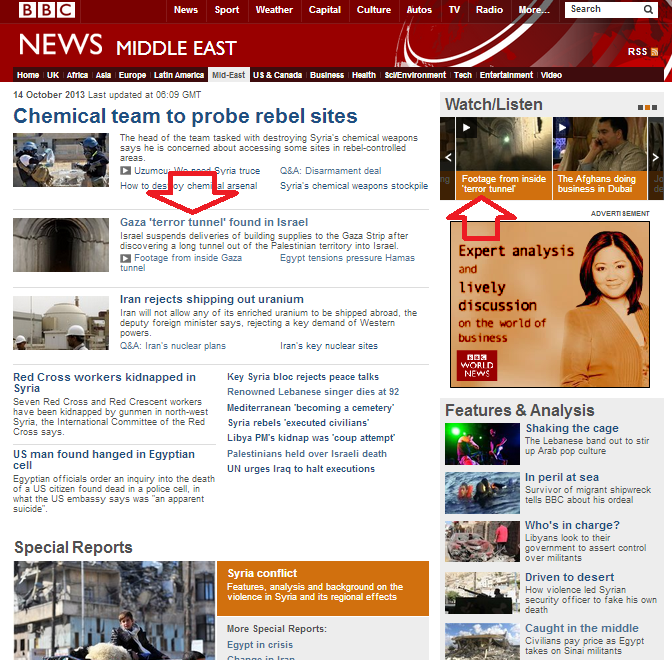 On the website’s Middle East homepage, visitors could opt for a filmed report or a written one – both of which displayed interesting use of scare-quotes in their headings. Does the BBC really think that the intent of the tunnel might not have been for purposes of terrorism, or that it might not have been found in Israel – as its choice of punctuation implies? As one BBC Watch reader pointed out to us, that use of punctuation is particularly noticeable in contrast with the headline to a domestic story which appears concurrently on the website’s main page. This is not the first time that the BBC has misled audiences in relation to the entry of construction materials for the private sector to the Gaza Strip: back in August the BBC Jerusalem Bureau’s Yolande Knell made similar claims. In fact, restrictions were further relaxed – rather than “lifted” – with the amount of materials entering the Gaza Strip for use in the private sector having been raised in September 2013 from twenty truckloads per day to seventy. Three months later – on September 19th 2007 – in light of the escalation of terrorist rocket attacks against Israeli civilians originating in the now Hamas-controlled Gaza Strip – the Israeli government declared Gaza to be ‘hostile territory’. “Hamas is a terrorist organization that has taken control of the Gaza Strip and turned it into hostile territory. This organization engages in hostile activity against the State of Israel and its citizens and bears responsibility for this activity. It is a pity that an otherwise reasonable article is marred by such sloppy inaccuracies and bizarre use of punctuation. Excellent work, again, by BBC Watch. I’m interested to know if anyone at the BBC subscribes to your emails? It is probably hard to know as they wouldn’t use a BBC email address but does BBC Watch have a policy of simply sending its work product to the BBC? Tomorrow I’m going to listen to Paul Danaher speaking at the Frontline Club and I wonder if he’s shown any reaction to the powerful analyses you have produced of his work? 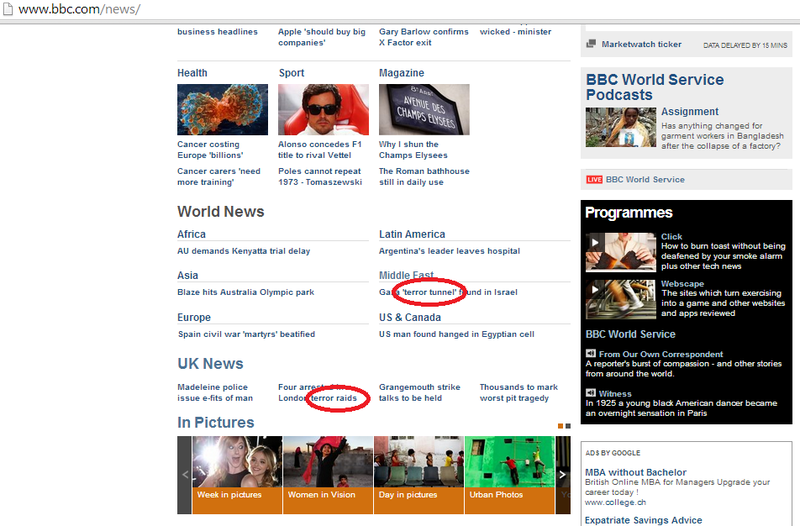 If this isn’t proof of BBC’s blind bias, what is?????????????????????????????????? 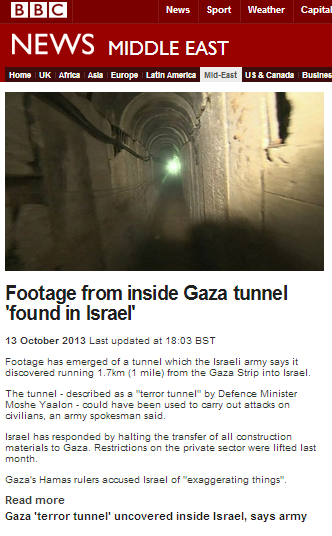 To be fair, the Beeb could argue that it was quoting Yaalon by calling it a “terror tunnel”. Of course, it is grammatically correct to put quotations into quotation marks. Don’t excuse. BBC always seems to see everything in anti-Israel colors. I would love to see BBC/Gaurdian coverage of the Jewish student dissing Gallaway. Duvid; IMHO, BBC knows exactly what’s going on. But if a few (or many) Jews get killed? Well, didn’t they deserve it. How dare Jews want a nation of their own. How dare Jews fight back. Vent over.